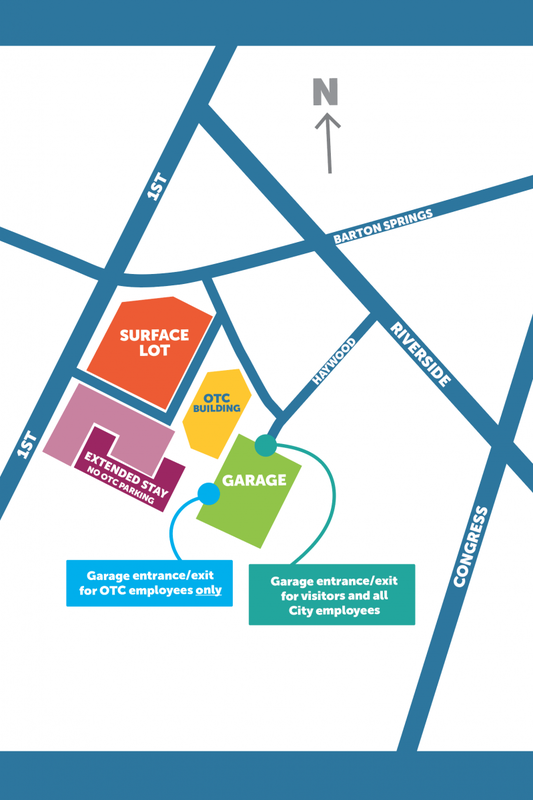 Effective Sept. 5, 2017, the Austin Transportation Department is implementing changes to One Texas Center (OTC) parking procedures to improve parking availability for City of Austin employees and visitors doing business with the City. Note: Parking in the garage is not permitted in spaces marked “Reserved." Visitors are required to enter and exit the garage by way of the north side (Haywood Ave. side) only. Click the illustration for a full-size image. Visitors who park beyond the free time limits will be subject to the rates below. Daily Rates: Monday – Sunday, 5 a.m. – 5 p.m.
Evening Rates: Monday – Sunday 5 p.m. – 5 a.m.
All rates include sales tax. Special event parking rates may supersede normal rates. Monthly Parking is limited and is based on a first-come, first-served basis. All rates include sales tax. Special event parking rates may supersede normal rates. City of Austin employees who are not housed in OTC but are conducting business there will not be charged to park in the OTC garage, provided they obtain validation. They are also required to enter and exit the garage by way of the north side (Haywood Ave. side), as illustrated above. City of Austin employees (OTC and non-OTC) who park in the surface lot are not eligible for validation and are responsible for the cost of parking.